Friends, Romans, Countrymen, lend me your ear. Stratford-upon-Avon is a historic market town, nestled on the beautiful River Avon. 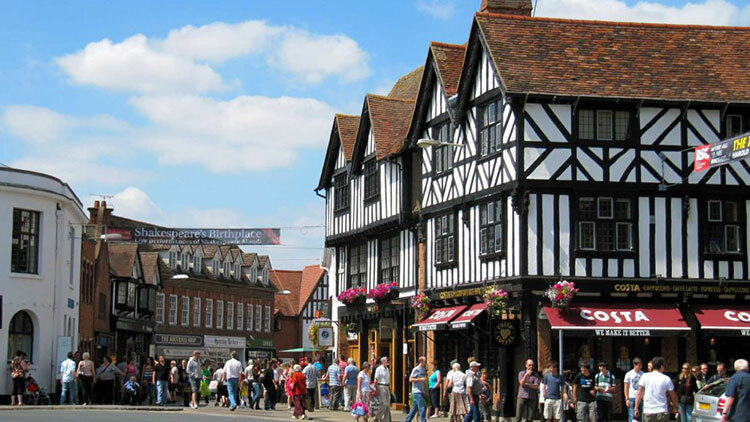 The market town of Stratford-upon-Avon was the birthplace of Shakespeare and, naturally, has plenty of attractions related to its most famous inhabitant. Catch a show by the eminent Royal Shakespeare Company at one of its theatres or visit some of the well-preserved buildings whose very walls tell the story of the Bard’s life and death. There are also plenty of nonShakespearean delights to round off a stay in this quaint Tudor town, like peaceful boat trips along the Avon and modern museums. There are plenty of ways to see the town. There are tour buses that leave frequently and offer an informative guided tour. There are also cruises along the River Avon, or if you want to go it alone, you can hire a small boat of your very own. Stratford is a relatively compact town so many people buy a map and opt to discover the town on foot. There are plenty of olde worlde taverns and pubs to take a well-earned break – to drink, eat and be merry!